There’s nothing more convenient when one is traveling than finding sleep in a hotel that houses a fantastic restaurant. From knowing that midnight dessert is just a phone call away to the convenience of running a few floors down for dinner in a snowstorm, hotel eateries are where it’s at, in this girl’s opinion. We were lucky to have a spot like Makeready Libations & Liberation in the basement of Noelle Nashville. Serving food from breakfast to late night dinner, it was perfect to pull into town, drop our bags, and head down for dinner on our first night in the city. 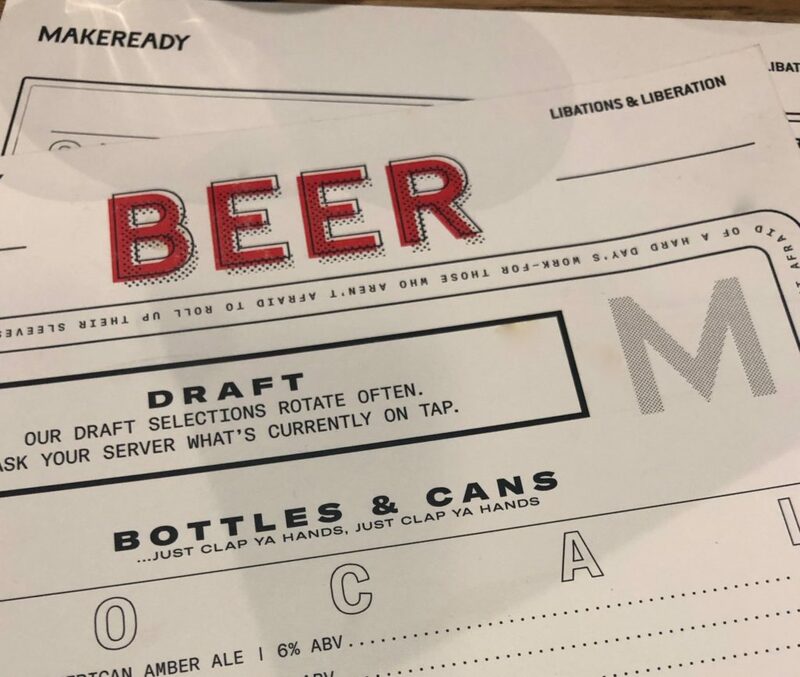 Makeready has an unexpected appearance for a food-centered local eatery. 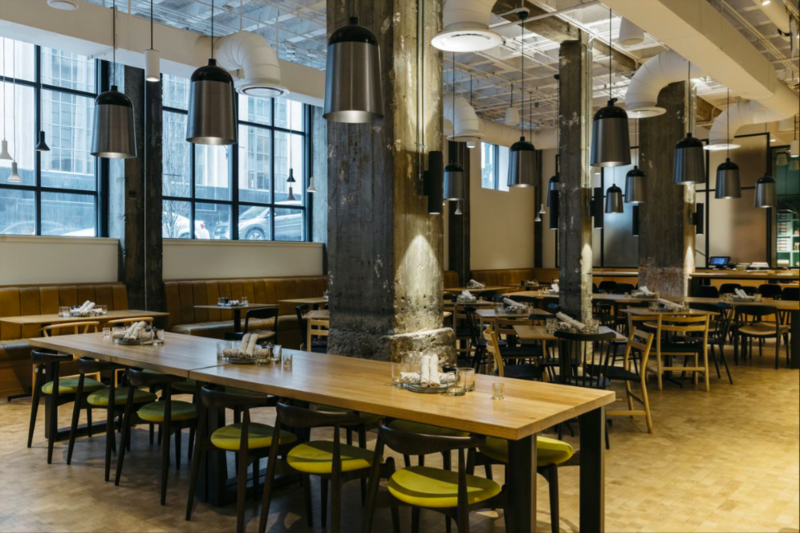 There’s an industrial feel, with exposed ductwork, heavy, concrete pillars, and metal-legged tables, but it’s softened by the curved lines of wishbone chairs and by the feel of butter-soft leather banquettes along its walls. It’s here, in a cozy leather corner, that we settled in while David Byrne and St. Vincent played on. Kelsey, our waitress (not to be confused with Kelsey, the best bartender in the city at Rye here in Louisville… we just have two Kelseys now), was charming and humorous- it’s a personality I love to encounter when asking opinions on food and drink. We began dinner with beers (a raspberry Berliner weisse for me and a peanut butter stout for him) and the country ham plate. Thin, shaved slices of ham were served with fluffy southern biscuits and sorghum butter alongside an assortment of pickles. I could have stopped there… But didn’t. I’m a huge fan of a good burger (and suggest the ones at Red Hog and Holy Grale here in Louisville), and from one burger-loving lady to another, Kelsey suggested I try the one at Makeready. 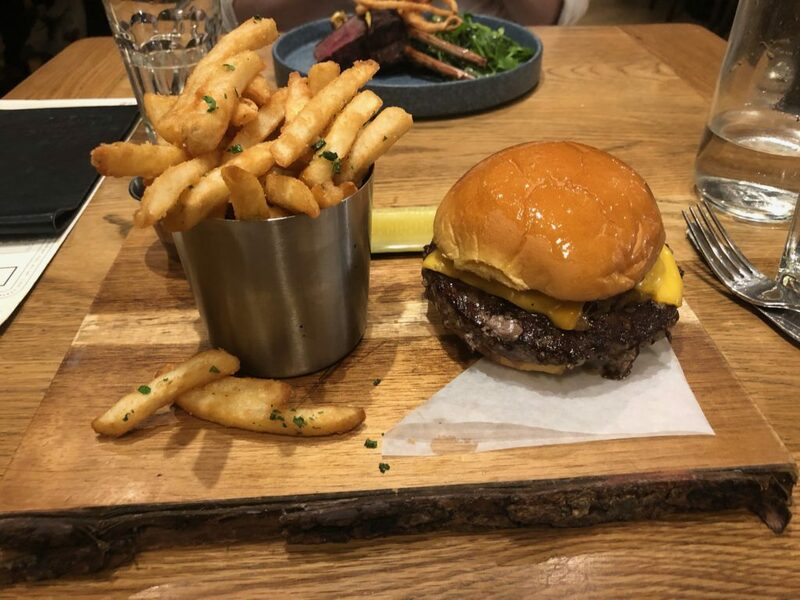 Topped with cheddar and carmelized onions alongside quite possibly the best fries I’ve ever had, their burger was fabulous! Cooked medium, still pink, on a very buttery roll. 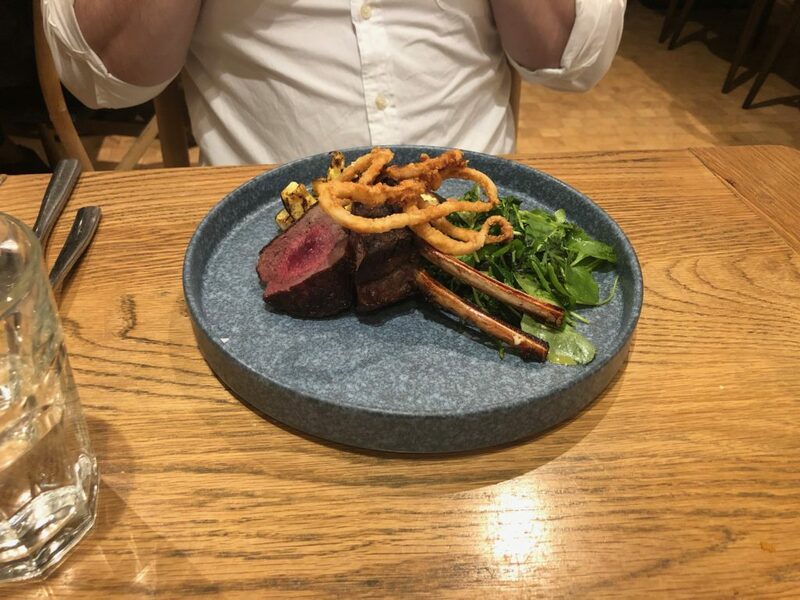 B was a little more adventurous and ordered bone-in elk shops drizzled with marrow butter, which came out medium-rare atop a pile of dressed greens and roasted acorn squash. For dessert, the man settled on a Fluffernutter sundae with brownie, toasted peanut ice cream and marshmallows, and we moved on to after dinner drinks- another stout for him, and a tasty concoction called Shore Leave for me- dark rum, lime, and Demerara syrup. We sat for a bit to let our food settle… It was getting late, the dining room was clearing out, and Kelsey kept popping by to chat and joke with us. Spoon and Vampire Weekend began playing softly in the background, and- tucked in the basement of Noelle- we amused ourselves by watching folks’ feet walk by on Church Street outside. Despite being out-of-towners, we felt comfortable here. Kelsey made it feel as if we’d been in a hundred times before, and there was this easiness about the space. While the dishes looked a little fancy (did you see the elk chops? ), there was humor peppered in. The beer menu announced bottles and cans with a Beck-forward sub-text of “… just clap ya hands, just clap ya hands,” and along the walls, beer growlers were printed with the restaurant’s slogan, “Work like a dog, drink like a fish.” It was cozy here, and it was very tasty, but mostly, it felt kind and familiar. Perfect for a southern eatery.